Welcome to your new pool home with pond view in the exclusive gated community of Stonegate by Southern Crafted. This signature Kensington home with 2,283 sq. ft. offers 3 bedrooms, plus den/office (which could act as a 4th bedroom), 2.5 bathrooms, and 2 car garage. The home boasts beautiful hardwood floors in the family room; ceramic tile in entry way, bathrooms and kitchen. The inviting family room leads to the screened lanai and pool area, great for entertaining and enjoying beautiful sunsets over the pond. For the chef in your family, the kitchen boasts 42 inch cabinets with granite counters, stainless steel appliances, a breakfast bar, closet pantry and breakfast nook. The master bedroom features a stunning tray ceiling. There is ample space in the walk in closet. The master bath highlights dual vanities, a garden bath with separate tiled glass walk in shower. Washer and dryer are included along with custom made curtains and rods. The gated community offers a clubhouse, fitness center, a large pool area, playground, fishing pier and a nature walk where you can enjoy a walk with your legged best friend. PREMIER Location, easy commute only minutes from the Suncoast Expressway, I-75 and Dale Mabry Hwy. 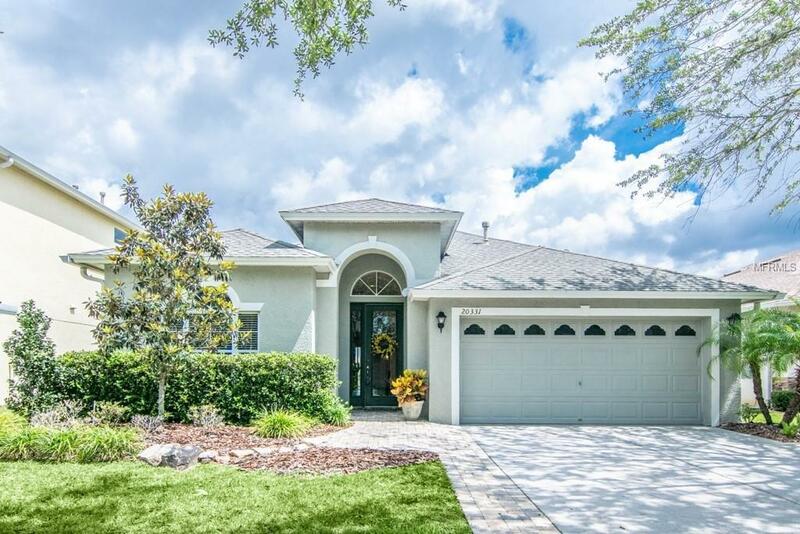 A short distance to beautiful beaches, Tampa International airport, shopping and dinning. This home is the BEST Value in Stonegate. Make an Appointment and see for yourself.